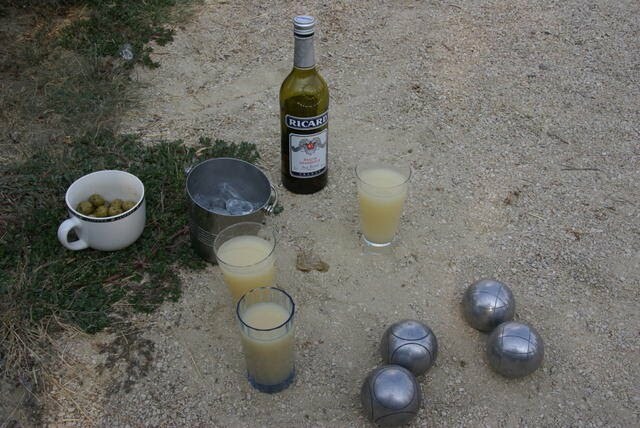 The Essentials: Pastis, Olives and Boules! 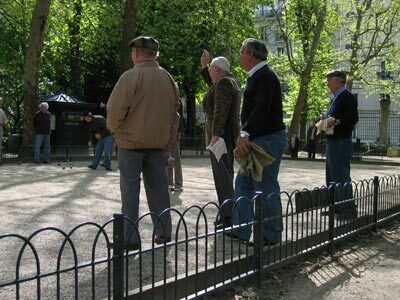 The game of boules, also known as petanque, is perhaps the sport that is closest to French hearts. Similar to British lawn bowling and Italian bocce, the French version is traditionally played with metallic balls in any open space in towns and villages on a dirt or gravel surface beneath trees, and always with a glass of pastis in hand. 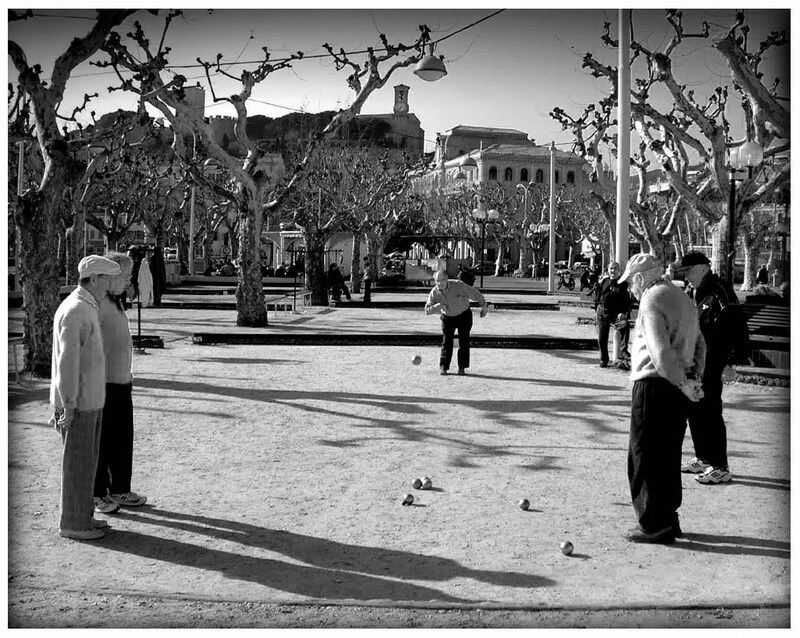 Boules is an essentially simple game. A small wooden ball, the cochonnet (literally “piglet”), is tossed up the court. Each player has three boules, identified by different patterns etched into the metal. 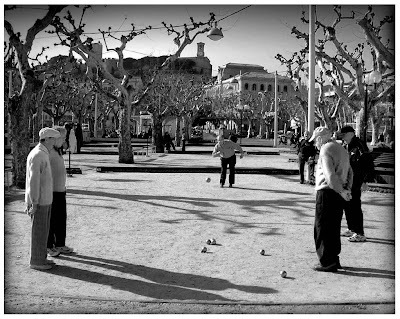 The aim of the game is to get your boules as close to the cochonnet as possible, or strike and drive the cochonnet toward your other balls and away from that of your opponent's. At the end of the round the closest to the cochonnet is the winner. I often see the same group of elderly well fed frenchmen having an argumentative evening on the court while strolling by with Rypien on our evening walk. From my observations so far, there seems to be two basic types of throws: the low rolling delivery or the high trajectory drop shot. The precision of these guys is remarkable, I swear they could drop a boule on my foot from 20 feet away. And there are of course the lesser elements of style: the grunts and encouragements that help a throw along, and the shrugs and muttered oaths when it lands short or long. There is a distinct slow rhythm to the game. A throw is made, and play stops while the next player strolls up for a closer look and tries to decide whether to bomb or attempt a low delivery. There are no hurried movements. Moistened fingers are held in the air to gauge the breeze. Anyone playing without a drink is disqualified. Disputes concerning the distance from the cochonnet are mandatory. And nobody's word is final.